Hi — I’m Devin, and I’m an English Professor at the University of Southen California, where I study how literature shapes society and our understanding of natural systems. I grew up in Albuquerque and Houston, and attended college at the University of Texas before heading east to continue my studies at Rutgers and Penn. My research examines the intersection of intellectual history, scientific literature, and the digital humanities, with emphasis on nineteenth-century British literature and science. My work on this subject has appeared in ELH, Studies in English Literature, Nineteenth-Century Contexts, Literature Compass, and Book History. 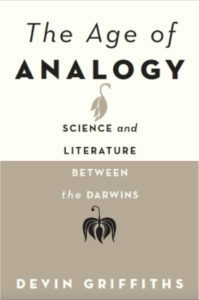 My first book, The Age of Analogy: Science and Literature Between the Darwins, published in 2016 by the Johns Hopkins University Press, examines how historical novels established a new relational understanding of history and furnished a new comparative method, shaping the disciplinary formations of both the life sciences and the humanities. It was shortlisted for the British Society of Literature and Science’s book prize, and was runner-up for the first book prize of the British Association for Romantic Studies. I am at work on a new book project: “The Ecology of Form,” which examines how Darwinian philosophy offers alternative models for ecology and the study of literary form.If you want to learn more about my work, visit my professional profile here.